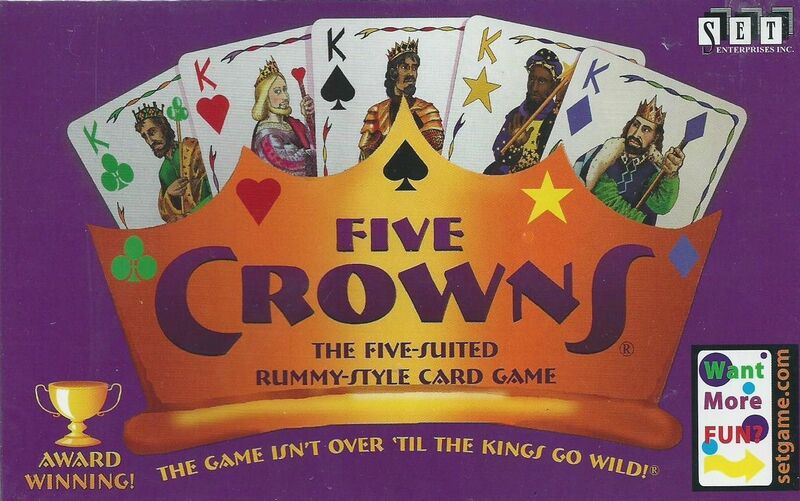 Five Crowns is rummy with a five-suited deck and a twist. The set collection aspect of rummy is basically the same, with groups of three cards in either runs or denominations making a valid meld. The twist is that in each hand the number of cards required to create a meld increases, from three cards in the first hand to thirteen in the last. The game, therefore, consists of eleven hands. In each hand, in addition to the six Jokers, other cards are designated as wild: in the first hand 3s are wild; in the second hand 4s are wild, and so on until in the last hand the Kings go wild. (You can remember which cards are wild because it matches the number of cards in hand, i.e., in the first hand you hold three cards and 3s are wild.) A hand ends when a player can meld all cards in her hand after the discard.